If you're looking over your 2016 photos and realizing that you don't have one that will make a killer holiday card, don't worry. 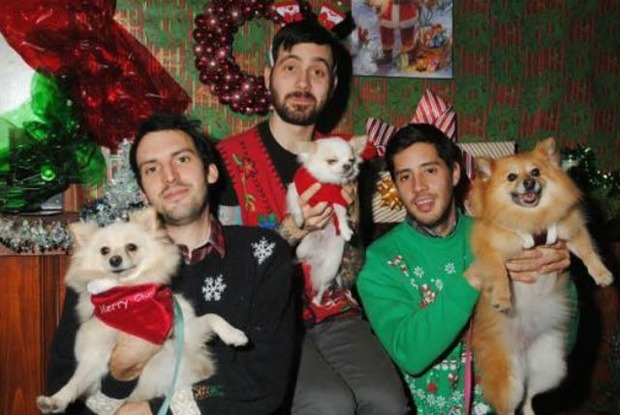 You have a prime opportunity to get that special shot this coming Sunday, December 4, when Bushwick Bark holds its fourth annual awkward family holiday pet photo shoot and Fundraiser at Troutman Street's Precious Metal! Hideous christmas sweaters, reindeer antlers and tinsel are all acceptable style elements at this early season holiday party. Your sweet pet can get acquainted with the other four-legged attendees as you avail yourself of the delicious, potent seasonal cocktail specials Precious Metal's mixologists will doubtless rise to the occasion with. Moreover, proceeds from the party will benefit tireless local nonprofits Bushwick Street Cats and SugarMutts Rescue as they gear up for the cold months. Stay tuned for the amount of the suggested donation (keeping in mind that Bushwick Bark keeps that number fairly low! ), dig out your favorite Chanukah dress, Kwanzaa coat and Solstice jeggings (or, you know, whatever) and head over to Precious Metal at 2 p.m. on Sunday! We'll see you there, Bushwick—happy howlidays!